The Mechwarrior Online team breaks down "loyalty decay" in the upcoming online sim, explaining that rank and rewards are permanent but your paycheck may be docked a bit. There's been some concern about the "loyalty point" system that will be used in the upcoming Mechwarrior Online to help ensure that players stay active and involved. Some budding mech pilots are worried, and not unreasonably so, that they're going to be unfairly punished when real life gets in the way of their online gaming. But in the latest developer Q&A, lead designer Paul Inouye says the system isn't unfairly punitive and that players won't lose any benefits or rewards if their loyalty points start to slip. "Loyalty decay is something that we want to implement to reward players who are truly dedicated to the game," he wrote. "This is not a measure of passion or loyalty to the game but a mechanic to keep the top tiers of player ranking in a highly competitive state." Once players achieve a particular rank, they keep that rank and all associated benefits permanently. Loyalty decay will begin once a player has been inactive for "a long period of time," providing a buffer for players temporarily distracted from the game. And while long-term MIA players will eventually begin to suffer loyalty decay, the impact will be relatively slight. "Let's say for example that you've reached the rank of Captain and have 5,000 LP. If your extended leave causes decay to kick in, you will not lose the rank of Captain. Instead, what will happen is, your rank will change to Honorary Captain," Inouye explained. "Now let's assume that you are away for so long that your LP has dropped to 3,000 LP. In order to remove the 'Honorary' part of your rank, you'll have to gain 2,000 LP. All the while, you will NOT lose access to the rewards and benefits of a regular Captain." "As a Captain, you would have been entitled to X C-bills as a salary per day as long as you logged in," he added. "As an Honorary Captain, your salary will be reduced slightly but returns to full once you become an active Captain again." He also noted that rank does not automatically confer command status during matches. "You do not get to tell people what to do because you're senior rank, you do not make important faction calls, etc.," he wrote. "Rank is purely a reward system for consistent and successful gameplay." 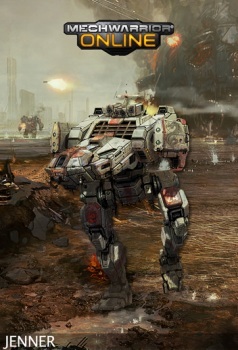 The PC-exclusive Mechwarrior Online is currently slated to launch sometime in 2012.